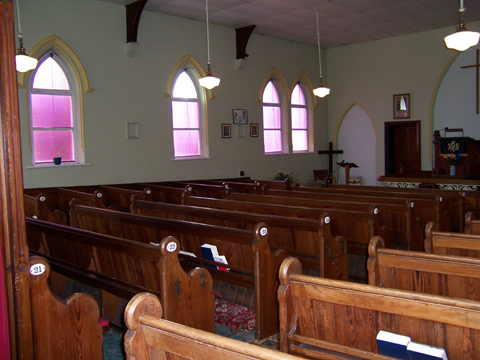 Methodist Chapels have been a feature of Britain for over 200 years. The Methodist Movement originated in 1730's within the Anglican Church and was founded by Church of England Minister John Wesley, who sought to question the religious assumptions of the day. 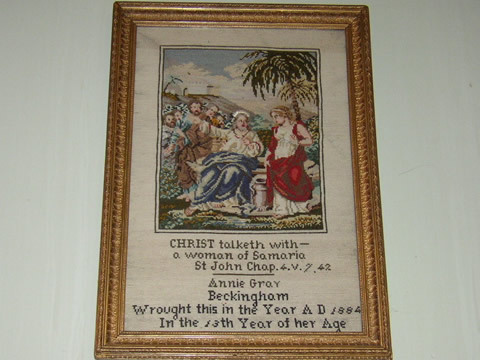 Born in Epworth, Lincolnshire in 1703 he was the son of Anglican Parish Priest Samuel Wesley and his wife Susannah. He, together with his brother Charles and other students, held regular meetings whilst in Oxford, for Bible Study, prayers and to do acts of charity. The group became known as the "Holy Club', or 'Methodists', as they were nicknamed due to the methodical way they carried out their faith. In 1739, John Wesley began preaching to large crowds of men and women in the outdoors, forming societies of the converted, encouraging them to meet weekly in smaller groups. He travelled up and down the country visiting the societies and preaching, which, with such radical ideas in those days was not without danger. He and his followers were denounced in print and from the pulpit, his meetings were disrupted, he was physically attacked and had many death threats. As the movement grew so larger buildings were acquired for use as a chapel, or 'Preaching House'. The first was opened at the New Room in Bristol in 1739 and is the oldest Methodist Chapel in the world. The money to build a chapel or convert an existing building had to come from the local Methodist Society and until well into the 20th Century, private houses and other buildings were still being used. Methodism as founded by Wesley remained largely as one during his lifetime, but after his death in 1791, there were many splits within the movement, some breaking away and some coming together. In the 19th century sizeable increases in membership led to the construction or enlargement of chapels all over the country, the size and style of which varied greatly. 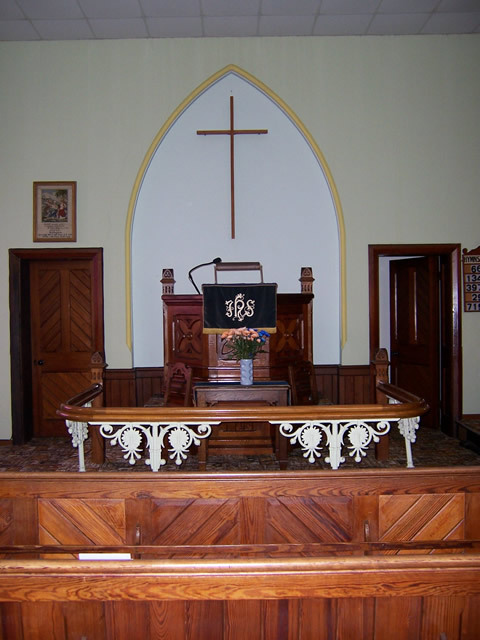 Often there would be several chapels in the same town or village, each representing a different branch of Methodism. The 20th century saw decreases in membership, which led to a union of three major branches of the movement. The Wesleyan, the Primitive and the United Methodist Church, came together in 1932, to form the present Methodist Church as it is today. This led to large numbers of chapels becoming redundant and over the last few decades many of these building have been demolished or converted to other uses, including private dwellings. 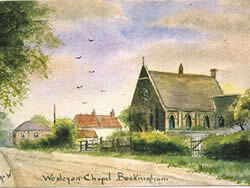 There are records of a Society of Methodists consisting of ten members in Beckingham in 1788. John Wesley is believed to have visited Beckingham in that same year, staying at The Hall with the Waterhouse family with whom he became good friends. 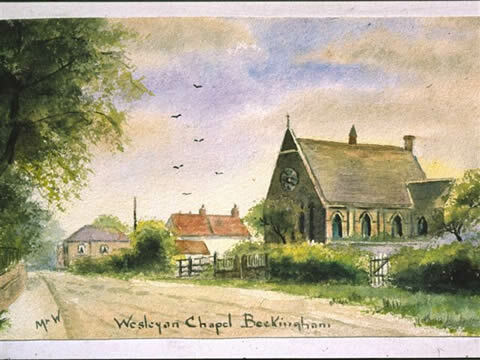 At one time there were two Methodist Chapels in Beckingham, a Wesleyan and a Primitive. The Primitive, situated on The Green, was in use until the early to mid 1900’s when it fell into disrepair before being renovated in the 1980’s and becoming the village Recreation Room as it is now. There is a separate page on this, to view click here. The land on which the original Wesleyan Chapel stood was the homestead of the Brumhead family in the High Street, which was then passed on to a Robert Cross. It is unclear exactly when the chapel was built, though believed to be 1842. 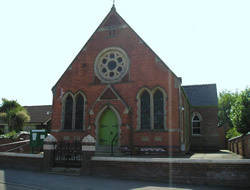 The Chapel was granted a certificate of licence for use as a place of worship for the Protestants of Beckingham by the Bishop of Lincoln in 1842. In 1885 it was decided that this chapel was inadequate for the needs of the Society and funds were started to build a new one. Members and friends worked tirelessly to raise funds with events such as sewing teas, sales of work and subscriptions. 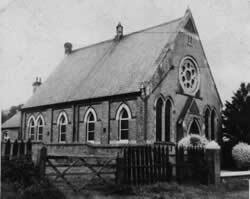 After the new Chapel was built just a short distance away, this building was used as the Sunday School room for some years, then for storage, until it was eventually demolished in the early 1970's. There are now bungalows where the Chapel once stood. 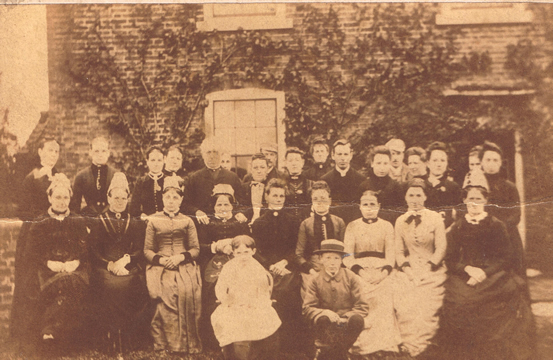 The land on which the second Methodist Chapel stands was donated to the village by the wealthy Cross family in 1894. The architects were Messrs Eyre and Southall of Retford and Gainsborough, the contractor was a Mr Theo Wilson of East Markham and the cost of the build was £1,050. The building work commenced in July 1895. The architects presented a silver trowel for the stone laying ceremony and a Mr and Mrs Barlow, who had both made donations to the fund, were given the honour of laying the first stones. 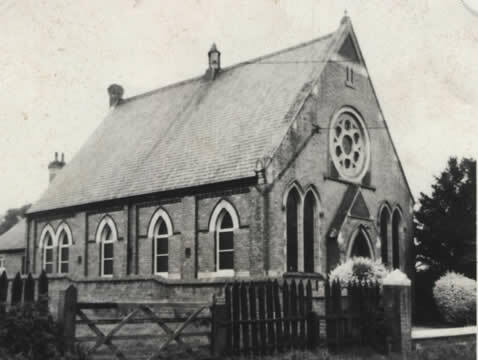 The opening service was held in March 1896, with the chapel crowded to overflowing and with Ministers attending from Hull, Misterton and Gainsborough. There was a public tea held afterwards in the old chapel with 300 guests, necessitating several sittings due to the lack of space! The Chapel is Gothic in style, built with the best-pressed red bricks of the time with Ancaster stone dressings. 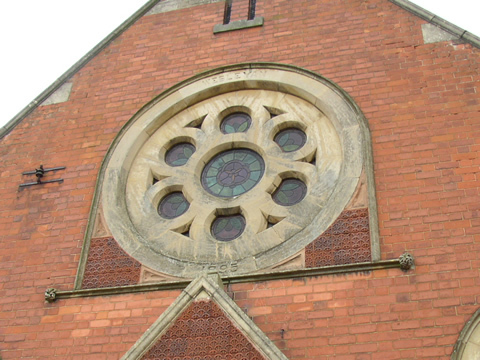 The front elevation above the entrance has a large stone wheel window and grouped lancet windows with stone mullions and panels filled in with ornamental terra cotta diapers. There are also Gothic headed windows to the front and down each side. The chapel floor stands four feet above the road and was originally approached by steps only from the pavement, though a ramp and handrail have since been added. The porch entrance is paved with Minton Tiles and has doors either side leading off to the aisles. 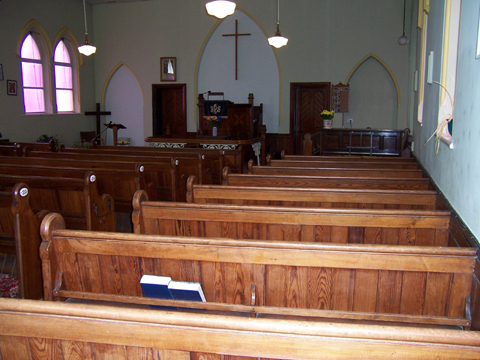 There is seating for almost 200 people with pews either side and in the centre, which are fitted with umbrella stands and bookracks. 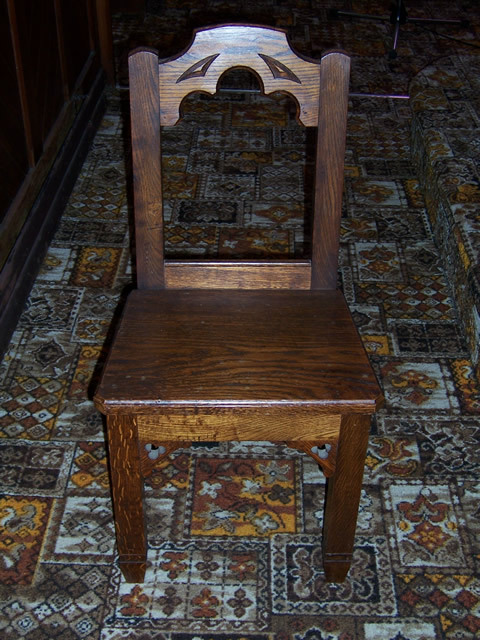 In the past members were required to pay a fee in order to use a pew, though this is no longer the case! The roof inside, now covered in by a false ceiling, is of open timber with bracketed principles match boarded up to the first purloin and plastered up to the apex. The walls are match boarded pew height and plastered up to the cornice. 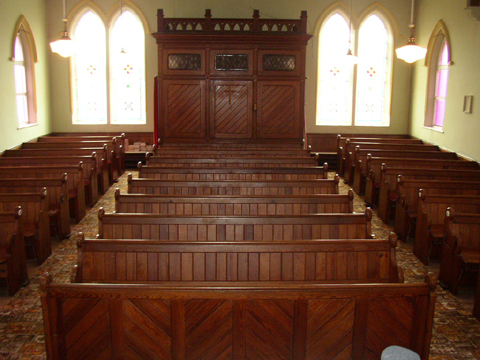 The inside woodwork is of selected pitch pine and varnished mahogany. The wooden floor, once bare with runners, is now fully carpeted. Surrounding the pulpit is an ornate communion rail inside which stands a communion table and chairs, made in 1953 by a Mr Harry Jervis a village resident who at one time was a draughtsman for the Watson Shipbuilders in Old Trent Road. 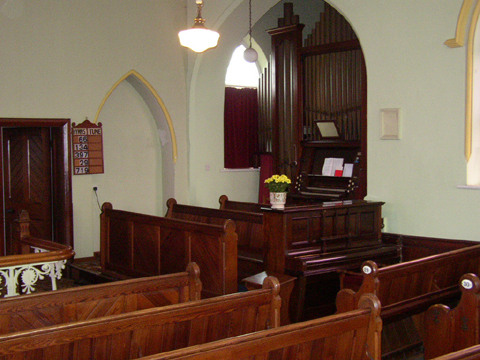 On the right of the pulpit there is an American organ, which was fitted in 1901 and there is also a piano. 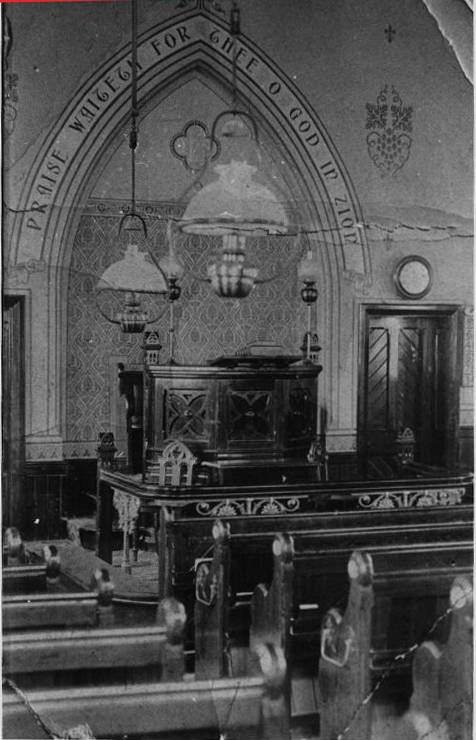 On the wall to the left of the pulpit is a tapestry which came from Lea Chapel, made by Annie Gray in 1884 when she was just 13yrs old. Wording on the wall above the pulpit once proclaimed "PRAISE WAITETH FOR THEE O GOD IN ZION", now no longer there. 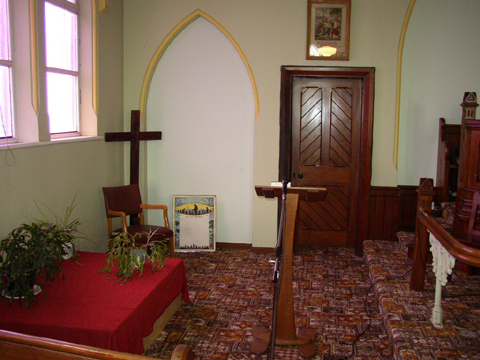 Doors on either side of the pulpit lead into a corridor which leads into the vestry, where Sunday school meetings were once held. There were originally two rooms here, a classroom and the ministers' vestry, but it was converted into one room in 1958. 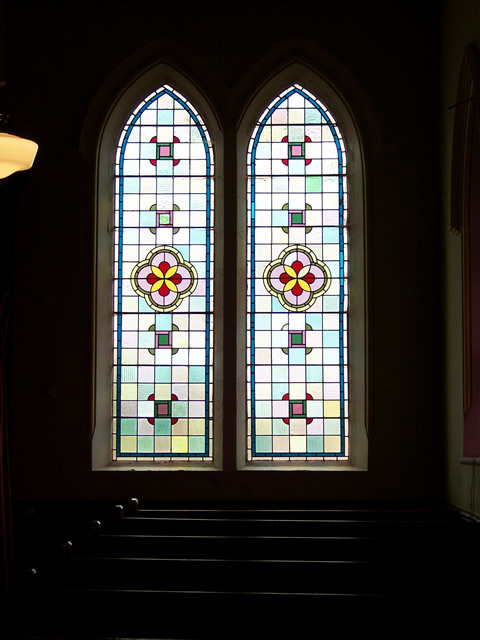 The chapel's windows are glazed with tinted cathedral glass worked to the architect's designs. In 1941 the windows had to be replaced due to damage from bombs being dropped nearby. In the early days oil lamps provided lighting but these were removed in 1930 when electric lighting was fitted and the oil lamps sold. The heating was originally by means of hot air flues, the apparatus being fixed in the basement under the minister's vestry, with a coal fire which had to be lit every time there was a service, heating warm air, this was then discharged into the chapel through metal grates in the aisles. The ventilation was by means of air pump ventilators and fresh air coming into the building through inlet panels, three each side. The cellar is now closed off and the heating is all by electric. Outside the Chapel there are two toilets, a ladies and a gents, which were built at the same time as the Chapel. 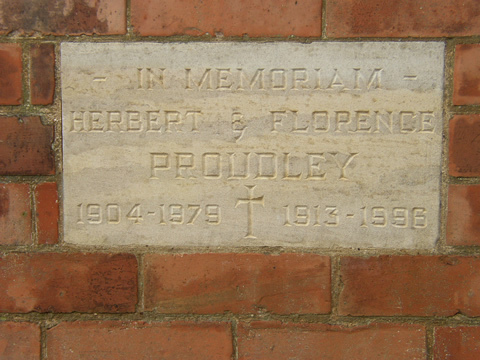 There is a memorial stone in the outside wall of the Chapel, in memory of Herbert and Florence Proudley who lived and farmed in the village. Florence was a member of the villages' first ladies cricket team in c1935. There is also a small hall behind the chapel, built c1960, which was used for Sunday school and social occasions, including at one time barn dances. It has a small kitchen area for catering and used for occasional coffee mornings. The whole area is enclosed by a brick wall five foot high with a dwarf wall to the front and gates hung on piers with worked stone-caps. The front wall originally had metal railings but these were removed for the war effort. Unfortunately, due to lack of members and finances, this Chapel is now closed, a sad loss to the village. The final service was a special circuit service on Sunday 19th August 2007, in which over 100 years of Methodism in Beckingham were celebrated. The congregation also included members of Beckingham Anglican Church. The service was taken by the Superintendent Minister Reverend Keith Lackenby and the Preacher was Reverend Stuart Gunson, who was previously the minister for Beckingham and is now on the Whitby circuit. Beautiful flower arrangements were on display and these had been done by the ladies of the chapel. A lesson was read by Mrs. C. M. du Feu. Mr Simmons was the door steward and Mrs D. Bell and Mr K. Bullivant were collection Stewards. The organist was Mrs J. Lynn and the hymns had been chosen by members of the congregation. Light refreshments were available at the close of the service. However, the Methodist Church Council and Anglican Parochial Church Council agreed that both congregations will hold their services together in All St. Church. A formal arrangement was drawn up by both churches known as Local Ecumenical Partnership. The first service was held on 26th August 2007 at 10.30am, after which representatives of each church will be devising a pattern of services embracing and respecting both traditions of worship. The Chapel has since become a private dwelling.